*You bet there are affiliate links in this post! So you're looking to start an online business eh? Perfect! I have allll the online business tips and I love sharing them. 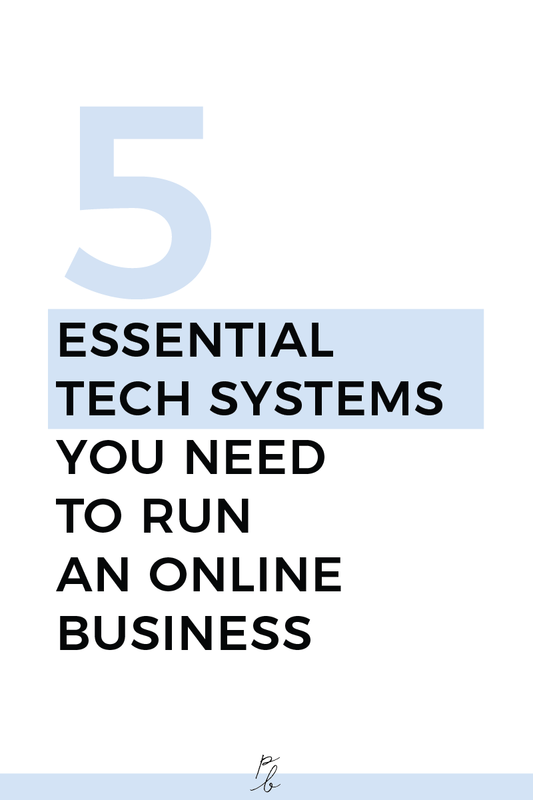 I know it can be overwhelming because there are SO many options for all the online systems that you could be using in your business and it's honestly really tough to know even where to start. So today I'll cover the essential systems you'll need, and I'll also share with you what I use and why I chose it too. Obv. You can't run an online business these days without one. Your website will be the online home of your business, the storefront your customers are greeted by, the place you win hearts, build connections and make sales. Basically, it's a big deal. I chose Squarespace for my website and highly recommend it to other small business owners and creative entrepreneurs. Why? Squarespace is easy to use, darn powerful (if you take some time to get to know the platform, I guarantee you'll be mind-blown with what's possible), there's no tech meltdowns, no security holes and other generally no-fun nightmares. Email, another essential these days. There's the obvious options of using @gmail.com, @yahoo.com, etc., but when you run a business, it's adds authority and trustworthiness to have your own email that is @yourwebsite.com. I chose the professional Gmail email option. I went for a professional Gmail account because GSuite is fab. With an online business, I end up needing to share documents frequently with clients and contractors and GSuite allows me to do so through Google Drive. Now, I store ALL of my business files in Google Drive, and if I ever hit my limit, I can upgrade with the click of a button to the next storage option. Don't get me wrong, I LOVED the cute planners and agendas for years. But one day I had to admit my online business would be better served with an online project management system. Moving my calendar, and tasks online has been such a game changer. When I brought a VA on to help me with a recent launch, I easily assigned tasks to her, linked the resources she'd need to complete them in the description, and had nothing more to do. If I had stuck to my old paper planner, I would have spent a half hour every morning writing an email describing tasks, due, dates, etc. Not to mention, with an online project management system, you can schedule things out years in advance. I put my tetanus shot into my project management system, which I won't need for another 10 years. Totally would have skipped putting that in my paper planner and probably forgot 10 years from now. You run an online business? You NEED an email list. You run an offline business? You NEED an email list. You run a blog? You NEED an email list. Every single successful entrepreneur I followed online when I got started was constantly on and on about how you NEED an email list. They either said how they were so thankful they started an email list from Day 1, or if they didn't they talked about how much they regretted not starting an email list from Day 1. I'll be honest, when I started my business, email felt boring and Instagram felt cooler. But if all the successful entrepreneurs were going on about email lists, I decided it would be best to shut up and listen to them. Boy am I glad I did! I no longer launch products and services to 'empty rooms'. I have a super solid group of subscribers who look forward to my emails and who I feel I've built a real relationship with. I am definitely well on my way to building those 1,000 true fans, and that relationship has been built in large part because of my email list. If you plan to do anything these days and want to be successful, you need an email list. I started on MailChimp and then hopped ship to ConvertKit when I was so over how difficult it was to do basic things in MailChimp like send opt-in gifts, track how well certain opt-ins were converting, and when I realized I was getting double, triple, quadruple charged for the same subscriber because MailChimp apparently made up their own form of math for counting subscribers. I am a super happy ConvertKit camper these days and always recommend it to others too. "Sorry, I have a call at 2:15 PM. What about 4 PM?" "Yes that works. I'm in EST though, is that PST or EST?" "Oh sorry yeah I'm in PST." "Darn, can't do that time either then. What about Friday?" Not what I call a fun time! I have ALL of my appointments booked through my appointment scheduling system, Acuity. It integrates with my GCal so if I ever have other appointments booked or blocked myself off for a day for vacation or other adventures, it doesn't show as an option for people to book. With an appointment scheduler, I can limit certain appointment types to only be possible to be booked on certain days or times. People then book appointments around the best hours for me. If needed, I'm happy to get flexible, but that's generally not needed and people just choose from the times they see available without fuss. I never have to deal with time zone changes, which is a god send as I'm frequently working abroad and constantly hopping time zones. In fact, I've legit had friends book Skype dates with me through my appointment scheduler because it's just easier than texting back and forth and figuring out time zones ourselves. I use Acuity for my appointment scheduling. I originally chose it because it's free when you have a Squarespace site, but honestly I'd pay for it even if it wasn't. Acuity is super powerful and can do much more than just booking basic appointments. So it'll definitely be able to grow with you if you start offering packages of appointments, paid services that have appointment times, etc. *There's affiliate links in this post. If you click through one, I'll make a commission at no extra cost to you. My margarita fund thanks you, much appreciated!